Hone your Pro Tools music production skills and create better tracks with Pro Tools 11: Music Production, Recording, Editing, and Mixing. 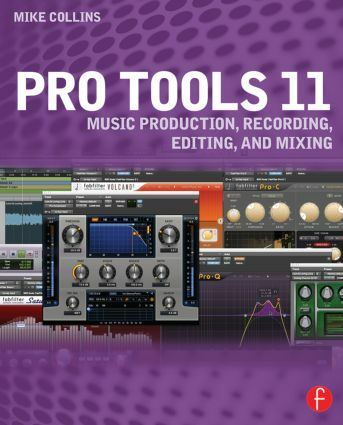 With Pro Tools 11, you’ll get more than descriptions of Pro Tools features and menus—this book grounds its Pro Tools instruction thoroughly in real-world music production. Learn to leverage this powerful DAW and bend it to your will, whether you’re recording and mixing a band or producing a dance track. Get tips that will save you time, even if you’re an old hand at Pro Tools. Extensive full-color screenshots visually guide you through the book, and an informal writing style keeps you engaged. Includes coverage of additional features incorporated into version 10.3.6, which can be co-installed alongside Pro Tools 11 to allow use of TDM and RTAS plug-in formats. Author Mike Collins, an independent music producer and music technology consultant who has worked with Pro Tools since 1991, gives you a frank view of the software without the hype. This book is carefully designed for users with basic music production experience or knowledge, but can serve as a quick learning guide for ambitious beginners or as a reference for the advanced or professional user.